The US President fielded numerous questions on Charlottesville and his response to the violence yesterday. IT STARTED OFF fairly innocuously, with a question about leading CEOs leaving his business advisory council. From there, US President Donald Trump had a small pop at Ireland, spoke of his love of facts and said his chief strategist Steve Bannon is “not a racist”. With Charlottesville the main topic of conversation, Trump again reverted to the line of denouncing the violence on both sides last weekend. He also claimed that bringing in more jobs would improve race relations in the US. One of the first questions that Trump fielded was “why did you wait so long to put that last statement out?” in reference to his eventual condemnation of hate groups. He repeated three times “I didn’t wait long”, but gave a more detailed response when the reporter put it to him that it was “at least 48 hours”. This detailed response was focused primarily on the issue of facts. “The statement I made on Saturday, the first statement, was a fine statement,” he said. “But you don’t make statements that direct unless you know the fact. It takes a little while to get the facts. Frankly, people still don’t know all of the facts. It was very important — excuse me, excuse me. It was very important to me to get the facts out and correctly, because if I would have made a fast statement — and the first statement was made without knowing much other than what we were seeing. The second statement was made with knowledge, with great knowledge. The President’s chief strategist Steve Bannon was editor of Breitbart News, a right-wing website that acts as a megaphone for Trump, and is believed to have had a major influence on Trump’s nationalist agenda. While he called Bannon a “good man” and “not a racist”, the President also sought to downplay his influence while hinting at the doubts surrounding his future as White House chief strategist. Trump said: “Look, I like Mr Bannon. He’s a friend of mine but Mr Bannon came on very late you know that. I went through 17 senators, governors and I won all the primaries. He is not a racist, I can tell you that. He’s a good person, he actually gets a very unfair press in that regard. But we’ll see what happens with Mr Bannon, but he’s a good person and I think the press treats him frankly very unfairly. RT TFTCS "RT BloombergTV "Donald Trump returns to blaming "both sides" for the deadly violence in Charlottesvi… pic.twitter.com/BN8HJCNnqo""
In the wake of the violence in Charlottesville that left one woman dead, and many more injured, Trump initially came out and said he denounced violence on all sides. As he said above, Trump said he waited for the “facts” before making a further statement where he said neo-Nazis and the KKK were “repugnant”. Yesterday, however, he doubled-down on his original line and said there was violence and blame on both sides. He said: “Well, I do think there’s blame. Yes. I do think there’s blame on both sides. You look at both sides. I think there’s blame on both sides and I have no doubt about it and you don’t have any doubt about it either. You have some very bad people in that group [neo-Nazis], but you also had people that were very fine people on both sides. The alt-right is now a well-known term in political discourse, referring to ideologies such as those put forth on Breitbart News, and is closely tied to ideas around white nationalism and right-wing politics in the US. The alt-right was used as an umbrella term by some to describe the KKK members and neo-Nazis that protested at the weekend. 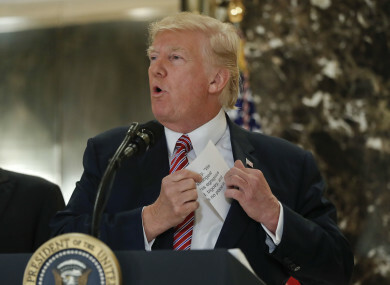 Trump challenged reporters to define what the alt-right is at yesterday’s press conference, when one put it to the President that Senator John McCain had pinned the blame for the Charlottesville violence on this group. He then switched the question to talk about the alt-left. Trump said: “Excuse me, what about the alt-left that came charging at the, as you say, the alt-right. Do they have any semblance of guilt? Let me ask you this. What about the fact they came charging — that they came charging, with clubs in their hands, swinging clubs? Do they have any problem? I think they do… You had a group on one side that was bad and you had a group on the other side that was also very violent. And nobody wants to say that, but I’ll say it right now. So what exactly is the alt-left? This article in the Washington Post highlights that the term has been used by some on the right to describe anti-Trump protesters and Black Lives Matter demonstrators. The alt-left has been cited by commentators on Fox News in reference to violent protests that have taken place in recent months, such as at the University of California at Berkeley over a planned appearance by Milo Yiannopoulos. In one section, Trump suggested that bringing in more jobs to the US would help to ease racial tensions. He was asked if he was concerned about race relations in the US, and his opinion was sought on whether it had gotten better or worse since he took office. Trump said: “I think they have gotten better. Or the same… I believe that the fact that I brought in, it will be soon, millions of jobs… I think that’s going to have a tremendous positive impact on race relations. I think that’s going to have a huge, positive impact on race relations. You know why? It’s jobs. What people want now, they want jobs. They want great jobs with good pay and, when they have that, you watch how race relations will be. In the very first question Trump was asked, about CEOs leaving his manufacturing council, he singled out Ireland. Saying that wants companies to set up operations in the US, instead of elsewhere, Ireland was the only country he specifically mentioned. He said: “Now, I have to tell you, some of the folks that will leave, they are leaving out of embarrassment because they make their products outside and I’ve been lecturing them, including the gentleman that you’re referring to, about you have to bring it back to this country. You can’t do it necessarily in Ireland and all of these other places. You have to bring this work back to this country. That’s what I want. In one of the more bizarre asides in the press conference, Trump told reporters that he owns a house in Charlottesville and that it had one of the largest wineries in the US. He said: “I own a house in Charlottesville. Does anyone know I own a house in Charlottesville? I mean, I know a lot about Charlottesville. Charlottesville is a great place that’s been very badly hurt over the last couple of days. I own actually one of the largest wineries in the United States that’s in Charlottesville. In actual fact, he doesn’t own the winery. Trump had previously claimed that it was the biggest winery on the US east coast, but this has been shown to be incorrect. Email “'Violence' on the alt-left and Irish manufacturing: Key moments from Trump's bizarre press conference”. Feedback on “'Violence' on the alt-left and Irish manufacturing: Key moments from Trump's bizarre press conference”.